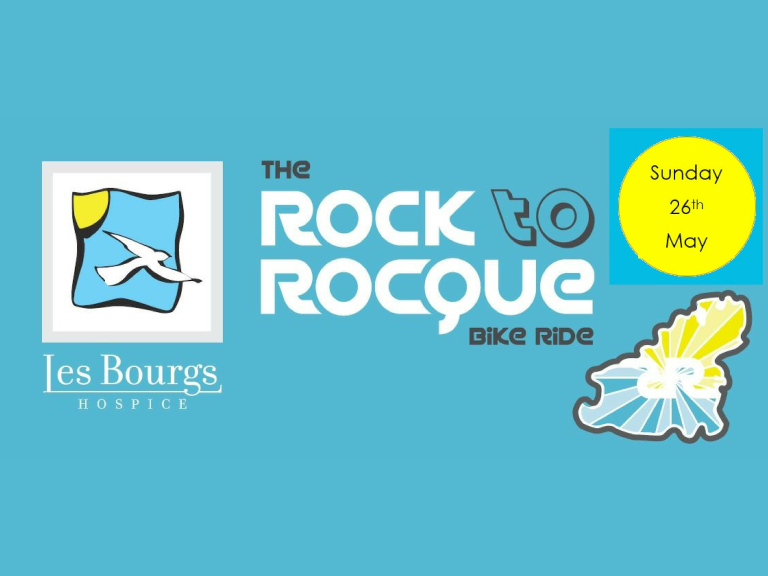 Rock to Rocque Bike Ride, sponsored by Heritage Guernsey for the benefit of Les Bourgs Hospice, on Sunday 26th May. The annual Rock to Rocque Bike Ride, now in its 21st year, has become a key event in the local fundraising calendar with all proceeds going to Les Bourgs Hospice. “The event was a massive success last year so we want to make sure people have it in their diaries early this year so that we can raise as much money as possible for the Hospice”, commented event organiser Mira Domaille. The event again coincides with the last day of Ian Brown’s 30/30 Challenge when cyclists ride for one hour every day for 30 days - also raising money for Les Bourgs Hospice. If you have tiny tots or cyclists who are less confident but who want to take part they can join you at Salarie Corner car park and come in the final part of the route with you on the cycle path. Please note this is not an official starting point so there is no registration here. The event finishes on the White Rock in the North Beach Car Park where we will be present until 1400hrs to give out medals and to cheer in the riders who have taken part. The cycle ride is not a race, but a family event where you can join with your friends and families at any point through the ride, the route is well sign-posted and has marshals at all key points so you cannot get lost! It is beautiful route around the island following the coastal roads all the way. The route takes you up through St Martins, along Fort Road, down past the Mallard Complex to Pleinmont Hill then along the coast all the way back to Town, there are plenty of cafes en-route to stop for a coffee and also lovely places to stop for a picnic on the way, as long as you reach North Beach by 2pm there is no rush at all, and we do check most people are in before we disappear so if you are close we will not go without giving you your medals if we see you have not finished. Entrance fee - £10 adults / £5 children. You are also requested to pay your sponsorship money in via the website, to ease administration, but if you are not able to then please send a cheque payable to 'Friends of Les Bourgs Hospice LBG' to us at Les Bourgs Hospice, Andrew Mitchell House, Rue du Tertre, St Andrews, Guernsey, GY6 8SF. If you are sending your money in after the event please remember to include a note inside advising us of your name and that your money is for the cycle ride. Please note that the roads will not be closed to traffic on the day of the cycle ride. Riders should be aware that the usual rules of the traffic apply and riders do have right of way or priority over passing traffic.